One of the main differences between England and Los Angeles that I have found is that where I’m from there isn’t a van on the side of the road selling mangoes. And coconuts with a straw. On the way back from the beach, tailing our way back from Malibu, wending our way up through Topanga Canyon, past the waves of blossoming, listing fennel and tall grey-green hills, there is always at least one open-backed van with a Mexican lady selling her boxes for $10 a piece. It could be avocados or strawberries, you’re never entirely sure, but you’ll be alerted by the signs. And then inside there’ll always be more. 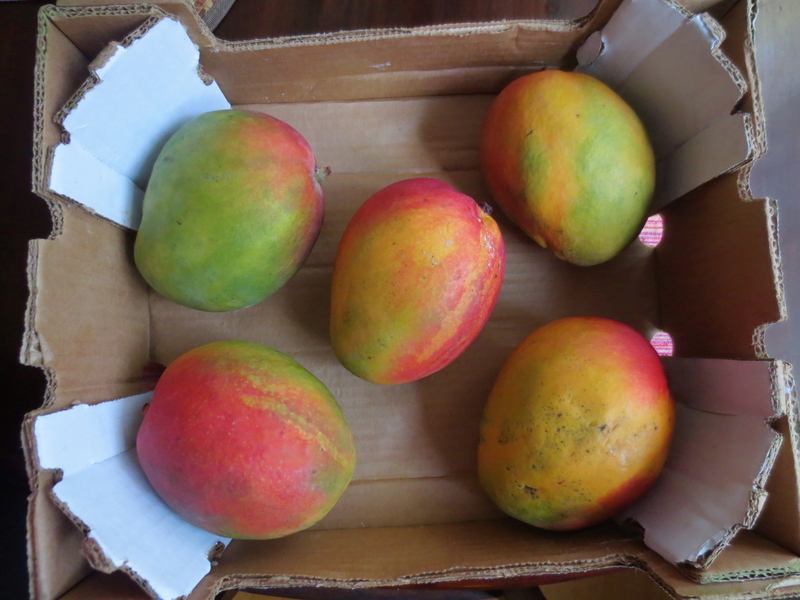 We bought a box of nine mangoes, but by the time we got home there were only seven. Mangoes are very hard to resist particularly when they have that give to them; these were on their way to softness, heavy as artillery in the hand, but oddly human to the touch, like a thigh or a calf. There is none of the banter here that you would get in England. A box of mangoes would yield at least a bit of to and fro about the weight – are you alright there, love? Oh, these ones are gorgeous, just cut it in two and have it with a bit of cream, lovely – a bit of rough and tumble, someone sighing that you were taking too long. There’d be something. Here the exchange is reduced to the price. There was no acknowledgement I was there from the man standing next to me, even though it was just him and me on the side of a dusty road. Him, me and the lady with the fruit. She had her hair in pigtails, which on her looked expedient rather than odd. The three of us did the deed knowing we would not be seeing one another again. It was on the tip of my tongue to say something, because as an English person it is hard to let a moment go by without some kind of dithering nicety. Hot isn’t it? The sea is cold. This road is long, isn’t it? It’s very green here etc. There’s none of that in LA. Here strangers tend to the loud and polite school of conversation – as if you have fallen down a well or a manhole but have sustained no serious injuries and would be up for a chat. “HI, HOW ARE YOU?” “Good, how are you?” “GREAT. ENJOY YOUR WEEKEND”. Or they’re silent, as if you’re not there at all. I have swum close enough in the pool to be able to read the typeface on a novel (by John Green), without so much as a flicker from the reader, perched on the steps with her legs under water, her torso dry as a bone, her nails a perfect peach. I would love to have said “Who’s John Green?” but that would have been to break the seal of silence, opening up a conversation possibly without end, and anyway I could always look it up on the internet. I don’t really want to know who John Green is, I just want you to know I’m here. I gave two more mangoes away so we were left with five. It was after a conversation with one of our B&B guests. She’d stayed for only two days and was on her way out, up the coast to Big Sur. But we got chatting and then an hour went by, and she left with a mango in each hand and the rest of the chocolate-cardamom cookies, because they spoke to her ‘Indian soul’. Originally from New Delhi, she is a writer, a reader and a lover of food. We exchanged favourite books; I will now be reading Climbing the Mango Trees by Madhur Jaffrey and How to Get Filthy Rich in Rising Asia by Mohsin Hamid. I hope my book recommendations made the grade, but it really doesn’t matter, because I had a conversation. A proper one. I made a friend. I bought some mangoes and gave them away. ENJOY YOUR WEEKEND! The trick to cutting into a mango, I have learnt, is to cut as close to the stone as possible. Cut on either side, vertically, so that you have two even slabs of orange flesh, and then a central panel with the stone embedded, which you can gnaw around. There is no point trying to be demure; you will be dripping in mango juice and picking the fibres out of your teeth, so you might as well enjoy yourself. Score the two halves of flesh (which will have the skin still attached) into cubes, which you can eat as you would an orange quarter or slice them off into a bowl to which you add lemon or lime juice. A meal would be a mango and avocado salsa, to which you have added some chile, cilantro, sea salt and lime. But to my mind, one of the finest uses for mangoes is in kulfi, the Indian ice cream. It is made traditionally with malai (milk boiled down to cream) but it can be reasonably faked with evaporated or condensed milk. Cutting for Stone is the name of a novel I have had languishing on my shelves for a while, unread, and now unreadable due to its being dropped in the bath (although the first chapter is fine and also very compelling so I will press on). I thought the title apt. Short stories. I haven’t read her memoir. Right now I’m reading BLOOD, BONES AND BUTTER by Gabrielle Hamilton of Prune fame. Some fruit has to be eaten without a knife, just with the teeth, and in the shower! I bought a copy of Cutting for Stone in Berkeley when I was there a few years ago and enjoyed it – I wondered when I saw the title if you were referring to it. We also bought some strawberries from beside the road on our way up highway 101 and I remember the lack of conversation and that English urge to comment on the weather. I wish I had time to make a trip down to LA next week – it would be lovely to meet you in person – maybe even have a conversation! You always manage to describe situations and feelings so accurately. I find the lack of banter here disturbing – there are people in my street that I have must have seen hundreds of times, and who I am still unable to elicit even a ‘hello’ from. I wonder why? That sounds great. I think we have a fairly narrow window of opportunity, but it would be really lovely if we could manage it. Sophie, you describe the situations I find myself in so frequently, so well. Funnily, on my trips to New York, my natural curiosity gets the better of me and I just have to strike up conversations. Maybe it’s my Irish accent that lets me get a way with it. Many people ignore me or look at me as if I was a couple of sandwiches short of a picnic but, I really have to keep at it. We are a social species, whether we like to admit it or not. Fear of breaking the seal of silence is spreading, I think. It’s becoming a joy to do it in London – particularly when I step into a lift! lovely read. Lovely post! In Minnesota there is Minnesota nice and small talk which (some) Finns find superficial and a waste of time. I have had similar experiences in Finland, I could pass the fellow swimmer here in Finland from 3 centimeters away and we would not exchange a word and the times I do open my mouth, I might get a strange look…or if they are elderly or perhaps in a chatty mood there might be a chance for a reply. Sometimes we pass each other on the sidewalk, we might look at each other from afar. As we approach both study to see who it might be and at last minute both look to the opposite side. It is as if there are unwritten rules of conduct and a clear respect of everyone’s privacy. You write so well that lots of things spring to mind when reading you! One of the nicest things about English people is their human dimension, no matter what happens to you there will always be someone kind to help you, that is very comforting indeed. As to mangoes, l find that chopping them in a chef’s way is rather wasteful and time-consuming so I deal with them in the same way as with avocado pears, i.e., peel them and then slice them as evenly as possible over a plate where all the juice falls as well, and work as close to the stone as possible without getting the fibrous bits into the plate. This is not done over a chopping board, you have to hold the fruit in one hand and cut towards you with a small knife that isn’t serrated or too sharp, like when you peel potatoes in the old fashioned way. Then you can add cayenne pepper and salt or gomasio (roasted sesame seeds ground with roasted sea salt) for a savoury version. Thank you for all your enjoyable posts. And that’s why I’m so enamored with Brits!!! Love love love this post. Some sort of serendipity took me to your blog and it’s lovely observations alongside your hymming of the humble mango – oh for a naturally ripe one. Here in South London they are either unripe or rotting, sadly. Until the day I can praise climate change and grow my own it will have to be holidays or mango cake for me to enjoy that syrupy sweetness. Maybe it’s the aging process, maybe it’s that little wisp of Olympic fever that remains hereabouts but I do find conversations easier to start than a few years back. Sophie, thanks again for hosting us and for gifting us the mangoes and the cookies. I returned to Idaho yesterday and have just begun exploring your fantastic blog. Let’s keep in touch and please, next time I am in LA, we must make kulfi.